Booster Gold appeared in two comics this week. The one I didn't mention on Wednesday was Old Lady Harley #3. 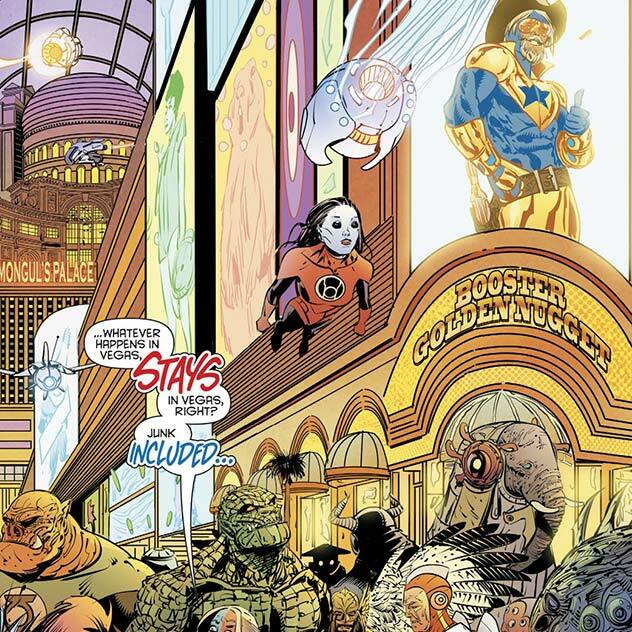 It seems that in the future, Booster will have his own Las Vegas casino. 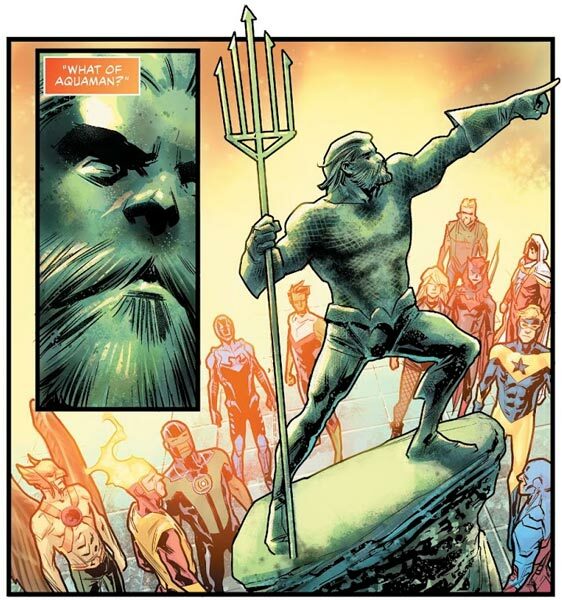 The other one was, as you are no doubt aware, was Heroes in Crisis #4. And while I have mentioned it already this week, it deserves a repeat post because of this panel alone. Ah, Blue Beetle and Booster Gold. My heroes. We still don't know what the shared history of these two is in the Rebirth DCnU. (It can't be time spent in the Justice League.) But who cares. 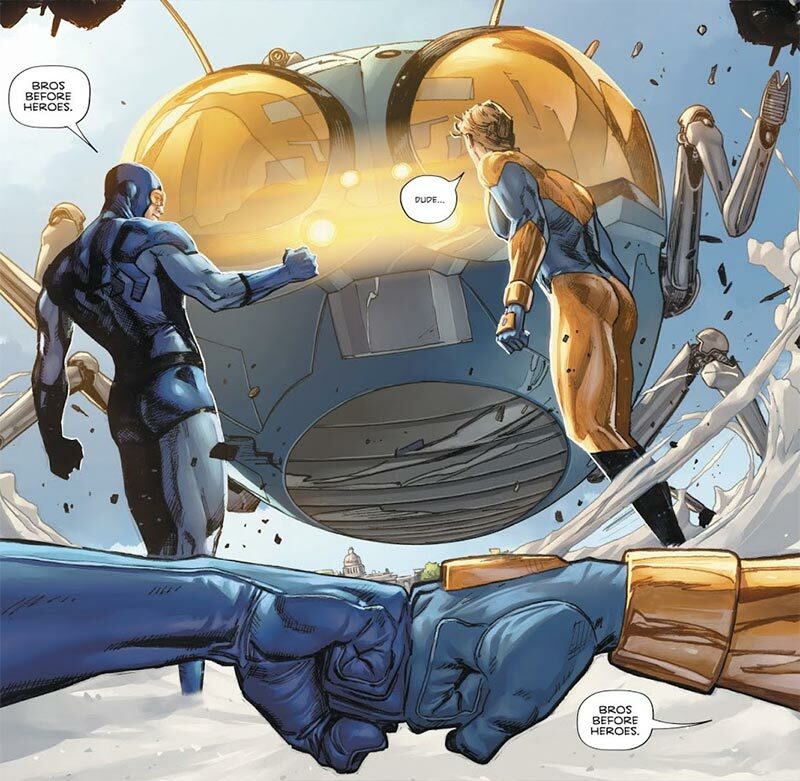 The friendship of Booster Gold and Blue Beetle cannot be destroyed by Maxwell Lord, Superboy punches, Doctor Manhattan ex machina or any other continuity-destroying device that DC throws at them. I'm worried for where Tom King might lead them, but they shall endure. Blue & Gold, a friendship through time and the multiverse. If you owned three Booster Gold comics and then bought five more, how many total comics do you have? As I was double-checking my collection against the Boosterific listings to make sure I hadn't missed anything, I actually found that there were two Booster appearances not listed in the database. Check out Tales of the Teen Titans #89 and 90--Booster shows up briefly in all his caped glory. Logan was right. I did not have those Tales of the Teen Titans in the Boosterrific database. Those issues were reprints of New Teen Titans #29 and 30 which I had somehow overlooked... for 30 years. *sigh* But that oversight is now corrected. Thanks, Logan! 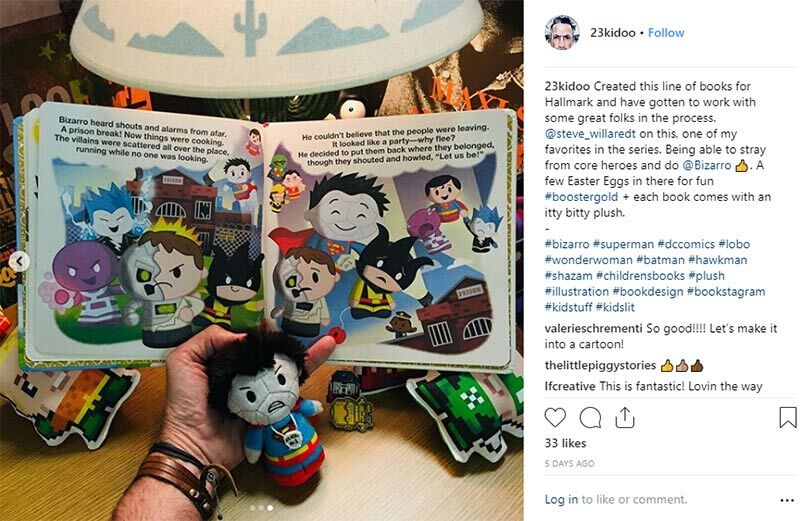 That book by Alex Boney and Steve Willaredt (in which tiny Booster Gold and friends appear to help Bizarro fix everything) is officially called the "itty bittys® Superman™ Bizarro™ Fixes Everything Stuffed Animal and Book Set." You can buy it on Hallmark.com for $19.95. It was released last year, and I may never have known about it without a shout out from The Blot. Thanks, Blot! Keep all the tips coming, Booster boosters! If you ever find anything that you think Booster Gold fans should know about, you can always drop me a line through my convenient contact form. You're all the best. If Booster Gold stole six super powers and then stole ten more, how many super powers has he taken in all? If Booster Gold had six costumes and Doomsday destroyed four of them, how many costumes remain? Booster booster Logan Peterson dropped by my mailbox to deliver this good news. Titans Special #1 by Dan Abnett and "various"
You can find a preview of Titans Special #1 on ScreenRant.com and the book itself now on the shelf of your Local Comic Shop. @Morgenstern: Glad to hear from you. (Hope you're doing well.) 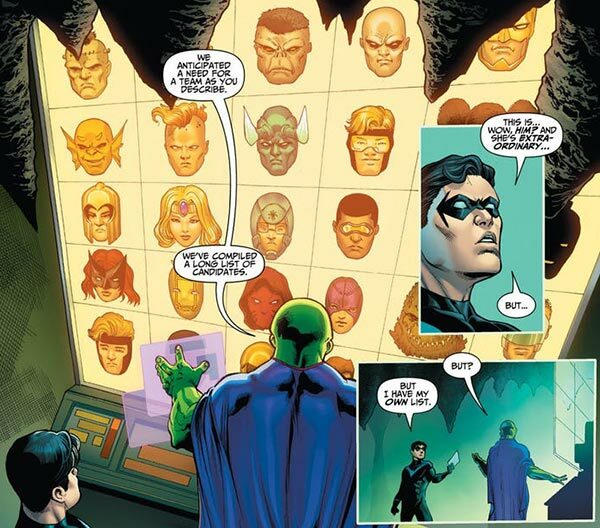 I admit that in this New 52 era, I don't recognize everyone on that screen. I'm glad Steven spoke up. Second row: Demon, mis-colored Captain Atom, Blue Devil, Booster, Bumblebee? Third row: Alpha Centurion?, Amethyst, Atom, unknown, Obsidian? Does that help anyone? Probably not. @Boosterrific: Thanks, I am still around and regularly check on your blog and Booster Gold, but for the last few years, I have found few reasons to invest much time (or money) in DC Comics. Even if my favorites get a rare appearance, it is seldom an enjoyable one for me. By now, hearing about a new story featuring Booster Gold, is usually just met with a sigh instead of eagerness. The recent run in ACTION COMICS was fun, but I do hear what you're saying. I'll be the first to admit that in 2018, there is much better entertainment value available for your time and money than the occasional Booster Gold guest appearance. First Row: Frankenstein, ?, Damage, Metamorpho?, Aztek? Second Row: Etrigan the Demon, ?, Blue Devil, Booster Gold, Bumblebee? Third Row: Alpha Centurion?, Amethyst, Atom, Black Lightning?, The Ray? Fourth Row: Batwoman, Ambush Bug, Azreal, ?, Clayface, ? Fifth Row: Animal Man, ?, ?, ? Could that really be Clayface? Why would he be a possible pick to join a JLA affiliate? They've really relaxed their entry requirements! @Boosterterrific : I don’t read many Batman comics, but didn’t Clayface become an anti-hero recently? I think I remember hearing that somewhere. If Booster Gold had three dollars and earned three more, how many dollars does he have in all? For the first time since Rebirth restored Ted Kord as Blue Beetle, he and Booster Gold are front and center in action again! Okay, maybe they're not "in" action, but they're close enough. Ted isn't much of a hero these days, not since the heart attack that sidelined him into mentoring Jaime Reyes. 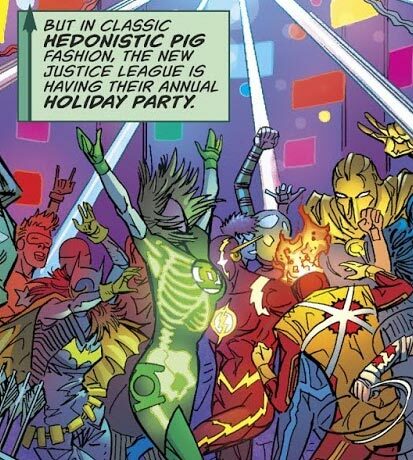 But he can still don his old costume for special occasions, such as when the real Flash — Wally West! — races S.T.A.R. Labs founder* Speed Buggy for charity as seen in this week's Flash/Speed Buggy Special. *No, really. Things developed pretty quickly in that comic. There's also a Reverse Speed Buggy now. Yes. Blue, Blue and Gold! If you had eight Booster Gold autographs and Booster gave you ten more, how many autographs do you have? If you had nine dollars and then spent four dollars on Booster Gold comics, how many dollars do you have left?